This issue is published at a busy time in mental health policy. The Government has launched a review of the Mental Health Act. Tight timescales, limited service user consultation and a Government hell-bent on curtailing welfare is not the best context, and we hope that something good comes out of it. We are always keen to link the struggle for better mental health care with wider socio-political issues, so we are pleased to include an article about the #metoo campaign. We were less pleased to receive a letter from a ‘disillusioned Asylum subscriber’, which we respond to in this issue. On the plus side, we’ve seen a few small victories for common sense: The high court upheld the view that PIP assessments discriminate against people with mental health problems; and the Bronx District Attorney found that the police killing of Deborah Danner, an elderly black woman experiencing psychosis, was unlawful. Black and ‘mentally ill’ lives do matter: Jeffrey Brooks makes a heartfelt and controversial (at least for Asylum) plea in this issue. 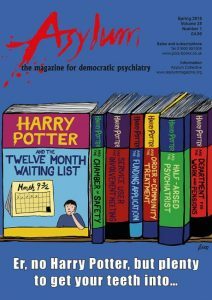 Whatever happens to the Mental Health Act – and we very much welcome readers’ views on this – we need ways of providing support and protection (not indignity and brutality) to those of us suffering mental distress. This issue also includes articles on Working to Recovery and the Greek Hearing Voices Network, alongside pieces on survivor poetry and a review of a recent film about ME, ‘Unrest’. We are always looking for reviewers for books and films.